Question: It seems like it's taking forever to drill the hole. Is the hammer drill or bit not suitable for the task? I've been at it for about 10 minutes and I'm about 1/2" into the rock: is this normal? Definitely using the wrong drill bit. You should be using a masonry bit, which is designed for drilling into concrete, masonry, and stone. It has a different tip than a regular wood/metal bit. I have been drilling 1" diameter holes to a depth of 6" in solid granite. I have been using carbide tipped SDS MAX masonry bits in a Makita HR4013c SDS drill. These holes are drilled in 50 seconds. I am drilling the holes to prepare for splitting the rocks, using feathers and wedges. I have not tried diamond tipped bits yet, because the carbide drills are cost effective for my use. You should be using a diamond wet hole bit. There are expensive ones which you do not need this unless you are doing this daily. You can get one for much less at the big box or cheap hardware store. You don't need to have a wet drill but someone spraying water will help - my son uses a spray bottle and keeps squirting while I cut. Also you do not use a hammer drill. You are lucky your pieces haven't cracked. Only other tip I can give is you need to go in a a slight angle and straighten it out once you get a solid footing on one side. Practice makes perfect. Not the answer you're looking for? Browse other questions tagged tools drill granite or ask your own question. 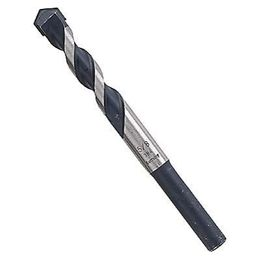 Will this drill bit work on concrete? Can I realistically replace my drill with a rotary hammer? Will a Bosch hammerdrill bit drill concrete faster than a cheap Makita bit? Is it normal for a hammer drill bit to wobble?